The most recently announced recalls. If you have a tip, please contact our reporting staff. 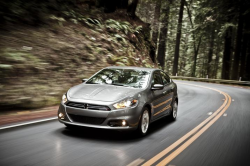 Dodge Dart Shifter Cable Recall For 299,000 Cars Chrysler says Dart drivers can move the gear shifters but the transmissions won't follow. BMW PCV Valve Heater Recall Expanded For Fire Risk BMW recalls 184,850 vehicles as an expansion of a 2017 PCV valve heater recall of 740,500 vehicles. Dodge Challenger, Dodge Charger and Chrysler 300 Recalled FCA recalls 8,000 vehicles with faulty instrument cluster software that can cause failed warnings. Chevrolet Equinox and GMC Terrain SUVs Have Weld Problems GM recalls 2019 Chevy Equinox and GMC Terrain SUVs with faulty welds on the head restraints. Mazda3 Windshield Wiper Problems Cause Recall Nearly 239,000 Mazda3 cars recalled to fix windshield wipers that may stop working while driving. Lexus Knee Airbag Recall Ordered For 2019 ES Cars Lexus recalls 573 ES models in the U.S. and Canada to replace faulty driver-side knee airbags. Jeep Wrangler and Ram 1500 Steering Wheels May Fall Off New 2019 Wranglers and 1500s have steering column components that may break while driving. Ford Engine Block Heater Recall Ordered Over Cords About 327,000 Ford F-150 and Super Duty trucks at risk of fires from damaged block heater cords. Porsche Recall Issued to Tighten Airbag Sensors Porsche recalls 417 vehicles that may have loose side impact airbag sensors. Porsche Recalls 2018 Panameras For Multi-System Failures Porsche Panameras may have suffered from faulty soldering that can cause driving problems. Acura Recalls 360,000 MDX SUVs For Tail Light Failures Acura MDX tail lights on the tailgates can short-circuit from water intrusion. Suzuki Recalls Kizashi and Grand Vitara For Shrinking Leather Suzuki recalls 41,000 cars and SUVs with airbags that may fail due to shrinking leather seats. BMW X7 Recall Issued To Tighten Seat Bolts 2019 BMW X7 xDrive40i and X7 xDrive50i SUVs recalled if equipped with business lounge seats. Volvo Recalls 2018-2019 XC60s and S90s Volvo says 2,300 XC60s and S90s may have front seats with missing seat rail nuts. Mercedes Recalls GLA-250 and GLA250 4Matic Eight Mercedes vehicles may have been built with the wrong seatback carpet.